I was visiting our production manager's home the other day where I found him restoring an antique chair. It wasn't a big job--nothing that couldn't be take care of with some wood stain and fabric. This got me to thinking about just how long a piece of modern furniture will last. A well constructed piece of upholstered furniture will last decades. If you think about all the materials that go into the construction of a chair or sofa there is not a lot that will degrade quickly. Wood frames, steel springs and foam cushions will last longer than most people. Relatively speaking, the fabric is the only part that has potential to wear out quickly. No mater how heavy the material, upholstery fabric is subjected to a lot. I'm not talking about stains and spills, but the constant friction generated when a person sits. Being a woven material, it is bound to eventually fray and break down. Vacuuming - Most people vacuum their floors, but rarely do their upholstery. 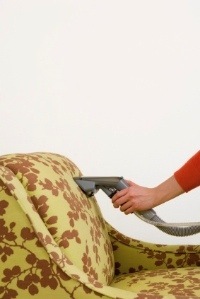 It's a good idea to vacuum your fabric covered furniture once per week. This removes surface dust and dirt before it becomes embedded in the fibers. It also decreases wear from the "sandpaper effect" which occurs from friction between the body, dust and the fabric. Turning Cushions - If your sofa, love seat or chair has loose cushions, flip them on a regular basis. This will allow the fabric to wear evenly and keep the piece looking newer for a longer period of time. Avoid the Sun - The UV rays of the sun are just as damaging to fabrics and finishes as they are to skin. Keep upholstery out of direct sunlight when possible. If you can't keep it out of the sun be sure to use blinds, shades, curtains or have the windows treated to block UV radiation. Use All of Your Furniture - I'm sure that in almost every room there is one piece of furniture that gets used the most. You have a living room that may be filled with many different types of furniture and the only piece that ever gets any use is the sofa. Make a habit of sitting in the less frequently used furnishings. The same goes for the dining room. If you always sit in the same couple of chairs rotate the chairs around occasionally. You can still keep the same spot--just use a different chair. Consider Fabric Protection - Fabric protection can be a life saver, but don't rely upon it solely. It will help block absorption and ease the removal of stains, but it's not an invincible plastic cover. You may especially want consider fabric protection on light colored natural fabrics, but it is probably unnecessary for dark fabrics made from synthetic materials. Ultrasuedes and microfibers are particularly stain resistant and may not need any additional protection. Following these guidelines will help you get the most from your upholstery. As I said before, fabric will eventually wear out. It is inevitable fact of nature, but how much life you get from it is up to you. One last thing I'd like to mention--before you clean any stains or dirt from fabric be sure to look up the cleaning code. Every fabric on our site has a cleaning code and it explains the best treatment to use. Some fabrics can be cleaned with soap and water, others need solvent based cleaners while a few can only be professional cleaned. If you use the wrong cleaner serious damage could occur such as fading. As always, if you ever have any questions about cleaning upholstery from Carrington Court feel free to call one of our design consultants (828.396.1049) and they'll be more than happy to assist you.